An investment in silver can be extremely lucrative, especially in today’s age. Silver is being used in applications for various everyday products- electronics, microwaves, jewelry, you name it, as well as being one of the hottest investment topics in the mainstream media. 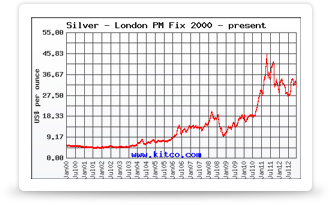 So if you’re interested in investing in a precious metal, the time to invest in silver is now. When you’re just starting out, a good choice is physical silver such as silver bullion bars and coins. Coins especially are easy to get your hands on and compact enough to store many in a small storage area. Now that you have silver in your hand, you’ll need a place to store it. It is an investment, meaning you stand to lose a lot if it gets lost or stolen. Though thefts are rare, you will need to be realistic and keep the possibility in mind when deciding where to store your silver. You can either store it at home, in a bank, or in a depository. Having your silver at home gives you peace of mind. If ever you need to access your silver in a hurry, all you have to do is go to a different room in your house to see it instead of driving many miles. When storing silver at home, you’ll really need to be vigilant and creative when deciding where to store it. Keep it safe by hiding it in creative places where it is unlikely to be found. Invest in a fire-proof security box or a floor safe in your basement or out in your shed and store your silver there. Additionally, you can distribute the silver in various places around your house. If you feel safer keeping your silver in a bank, you can place it in a bank safety deposit box, where it is under the protection of the bank. Though banks do have high security, they are not infallible and losses can occur. You do need to consider that bank safety deposit boxes are not insured. Also, since many people store their valuables in the bank; if there is any panic, there could be a time delay in when you can access your silver, if at all. A depository company takes custody of your silver and stores it for you. Your silver does not become part of the company’s trust and they have no rights to touch your silver. Depending on the company, your silver will either be segregated, or non-segregated and pooled with the silver that other customers have placed in custody. Depositories use high-tech alarm systems to safeguard your silver and their additional security is impeccable. One advantage of storing your silver in a depository is that they are insured and handle your transactions- sending existing silver and receiving new silver- securely; they even utilize armored vehicles for transport. If you choose a depository in Delaware, you receive a tax break and don’t have to pay for sales tax and other taxes. Over the years, taxes can really add up if you become serious in your silver investment. The best way to protect your silver is not to tell anyone about it. If no one knows you have a valuable amount of silver, no one will target it. Choosing to store your silver at home or with a depository company are both among the safest options for you to store and protect your silver.